A River In Time — Christine Gregory — 10th November 2014. Just eleven months ago we had a riv­et­ing talk by Christine called “Brown Hares In The Peak District” and if any­thing this talk was even better. The story was about a Peak District River called the River Bradford in the White Peak. The River Bradford (cour­tesy of Christine Gregory). We were taken on a jour­ney from its source in Gratton Dale through Bradford Dale to the point at which it meets the River Lathkill, east of Youlgrave. Visitors in their hun­dreds enjoy the pic­tur­esque beauty of the dale all year round but Christine explained that it was not always like that. The River Bradford was a source of food and power for industry going back to medi­eval times. 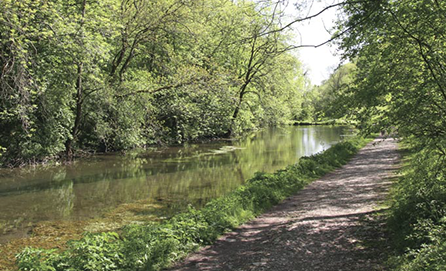 The first part of the river is known as Rowlow Brook until it reaches Moatlow in Upper Bradford Dale and then its name changes to the River Bradford. This area of the river was rich in wild­life but intens­ive farm­ing had a dis­astrous effect redu­cing the bird pop­u­la­tion and wild life by 50%. Cattle also trampled down the river banks des­troy­ing the homes of the Water Vole. However recent con­ser­va­tion of the area is having a pos­it­ive effect and all types of life are return­ing. Below Youlgrave the river widens out because it was dammed in medi­eval times to create fish ponds for food. Lead has been mined in this region since medi­eval times and as the work­ings got deeper it became neces­sary to drain them by dig­ging drain­age tun­nels known as soughs; but these soughs altered the bal­ance of water in the region. Hillcarr Sough, which was star­ted in 1766 took twenty one years to dig and at four and a half miles is the longest in Derbyshire. In 1882 the River Bradford dis­ap­peared down a mine shaft and flowed straight down Hillcarr Sough. Attempts were made to block the hole with cart loads of stones without suc­cess but even­tu­ally it was sealed with brush­wood but hydro­lo­gists believe that the dis­ap­pear­ance of the river in times of drought can still be blamed on the giant drain. Apart from lead mining there was also a fact­ory at Goose Holme making red tape, ribbon, pill boxes, and bob­bins. This area looks pic­tur­esque now but it must have been ter­rible in the 1800s.